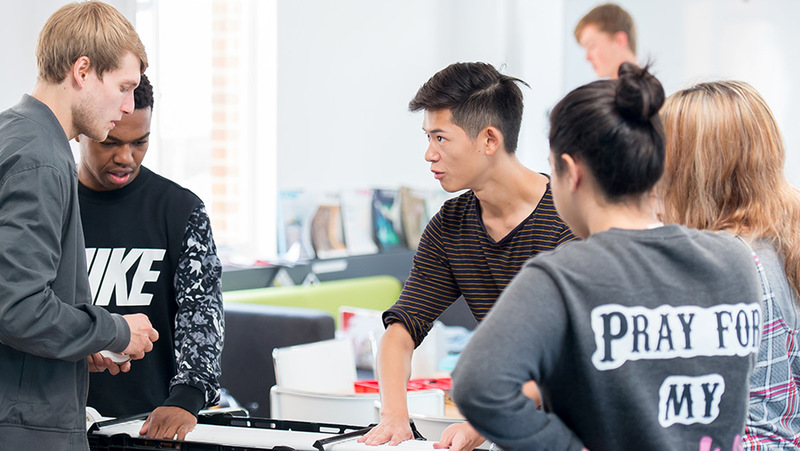 At Sussex, you’ll be taught by design experts with industry experience combining art, science and technology. You’ll learn to design products that satisfy the needs and behaviours of people and society. From day one, you’ll be working with industry professionals on live creative briefs, and you’ll have opportunities to commercialise your products. We ground you in design thinking so you can develop informed solutions and produce them through prototyping and manufacturing models. You’ll also consider how your products may be recycled or re-purposed at the end of their life – designing for the circular economy – a skill desired by the industry. Our teaching prepares you for success: our students have won awards from design leaders such as LEGO and Hasbro. They’ve also taken their own designs to market through the Sussex Innovation Centre. This course is accredited by the Institution of Engineering Designers. A-levels should include Art or a design subject. Without A-levels in these areas you will still be considered but will need to demonstrate a strong, recent background in art and design through other means. You must have GCSE (or equivalent) Mathematics with at least grade 5 (or grade B) and, if you are not offering Art or a Design subject at A-level you must also have GCSE Art or Design Technology at grade 6 (or grade B). The Access to HE Diploma will need to contain substantial amounts of Level 3 credit in Art or design. Applicants without an Access containing Art or Design will still be considered but will need to demonstrate a strong, recent background in art and design through other means. You must have GCSE (or equivalent) Mathematics with at least grade 5 (or grade B) and, if you are not offering Art or a Design through your Access you must also have GCSE Art or Design Technology at grade 6 (or grade B). You must have either Art or a design subject at A-level grade B or Cambridge Pre-U Principal subject with a least M2. Higher Levels should include either Visual Arts or Design Technology. Applicants without one of these at Higher Level will still be considered but will need to demonstrate a strong, recent background in art and design through other means. A-level should be Art or a design subject. Without A-levels in these areas you will still be considered but will need to demonstrate a strong, recent background in art and design through other means. The BTEC Level 3 National Extended Diploma would normally be in Art and Design. Applicants without this will still be considered but will need to demonstrate a strong, recent background in art and design through other means. Highers must include Art or a design subject. A-levels should include Art or a design subject. Applicants without A-levels in these areas will still be considered but will need to demonstrate a strong, recent background in art and design through other means. Evidence of academic studies in Art or design with good results is essential. Evidence of academic studies in art or design and mathematics with good results are essential. Evidence of academic studies in Art or design with good results are essential. Pass Ylioppilastutkinto with overall final result of at least EEMM, which should include Art or a design subject. Without relevant qualifications in these areas you will still be considered but will need to demonstrate a strong, recent background in art and design through other means. Evidence of academic studies in art or design and mathematics with good results is essential. Pass Matura with least 3 Extended level subjects in the 75th percentile including Art or a design subject. Diploma de Bacalaureat with an overall average of 8.5 including a score of 8 in Art or design subject. Fullstandigt Slutbetyg/Högskoleförberedande Examen with a total of 2,500 credits to include B grades in the majority of subjects and evidence of academic studies in Art or design with good results is essential. You'll develop creative, problem-solving and project-management skills throughout your course. You can attend tailored careers events, including drop-in sessions, industry talks and one-to-one support. Recently, some of our Product Design undergraduates won a design competition, creating a brand new toy concept at the Inventors Workshop conference. The students worked together as a team on a live brief, using the skills they gained during a module on Toy and Game Design at Sussex. Their ‘Bandit’ wristband concept won the Inventors Workshop New Designers Award. a design engineer or product developer. If you meet the academic requirements for this course you will be invited to a portfolio review to discuss your portfolio and your design abilities.